Description : A baseball bat is a smooth wooden or metal club used in the sport of baseball to hit the ball after it is thrown by the pitcher. Wooden natural lacquered with grip. Our range of Indian Base Bat consists of high quality wood like White Ash, Hickory, Maple and others. These are manufactured in our company with the lightest wood and designed in a way to offer maximum torque while swinging. 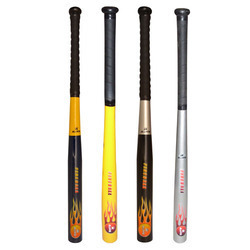 The power and speed these bats generate is tremendous as, the thrust of ball the ball is dampened due to the usage of fiber in manufacturing process.